An alert drainage engineer working for Lanes Group plc reacted quickly to protect other motorists from a sink hole he spotted in the middle of the road. Robotic Cutting Engineer Alan Wright had been driving a five-tonne truck through Eccles, Greater Manchester at 4am on Thursday 28 March 2019 when he spotted what he thought was a large pothole. When he got closer, he realised it was a sink hole so quickly stopped his van over the top of it and activated the vehicle’s yellow beacon lights to alert motorists behind him of the danger. Alan had been part of a team returning to the Lanes depot in Eccles after carrying out highway drainage work on the M60. He had been driving along New Lane in Eccles when he spotted the hole, measuring about a metre long and half a metre wide right in front of him. Lanes Lining Division Manager Sue Kenyon said: “Alan prevented what could have been a serious incident. The sink hole could only just have opened minutes before he drove towards it. When three other drainage engineers – Ryan Wheelwright, Daniel Zarelli and Gareth Knox – arrived at the scene, they used their two vehicles, a jet vac tanker and a van, to block the road. They then called the police who, in turn, alerted the highways authority which sent a team to investigate and put in traffic control measures. The Lanes personnel were on scene for over an hour, helping to ensure the sink hole did not cause a hazard for motorists and members of the public. 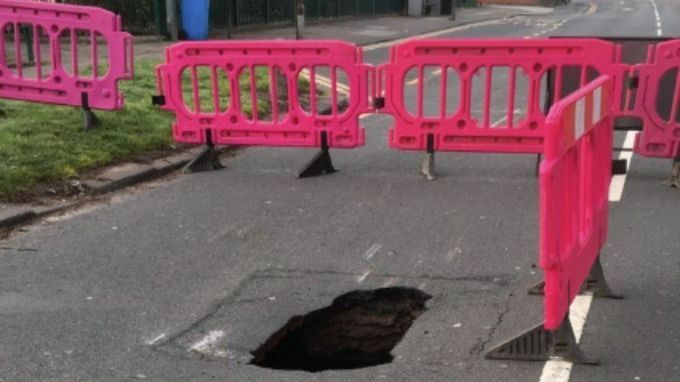 Police said New Lane would remain closed, between Beech Street and the A57 Liverpool Road, while the sink hole, reported to have been caused by a collapsed sewer, was repaired.